Jake (el gallo) died yesterday of unknown causes. He was almost two and lived at The Chicken Store for much of his short life. 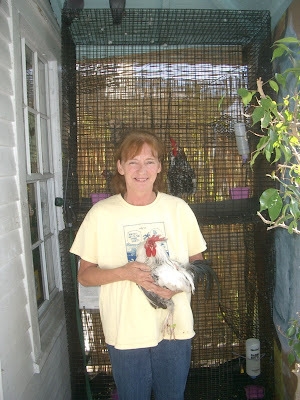 He quickly became a favorite among the small flock of Key West Gypsy Chickens who make the store their full-time residence. An autopsy and toxicology exam are being done to try to determine how Jake died. His behavior yesterday morning showed signs consistent with poisoning. Jake never went outside, except on the screened-in porch in the rear of the store, but he and his water dish were accessible during the day to those who came into the store. Janet says that some of the Meanie Boys were in the store recently. They are youngsters in Key West who are known to treat chickens badly and therefore their visits to the store are always regarded with suspicion. They sometimes offer to sell a chicken they've captured (an offer that is never accepted) and have even offered to buy a particularly handsome rooster, perhaps as a potential cockfighter. Yesterday was Janet's birthday and we spent the day doing things together. When we got home and got a message that Kate called, Janet was nervous that something had happened. She was devastated when Kate told her that Jake died. She wrote a letter to him that will be read at his burial service later today. Olivia also took the news hard. When she was working at the store, she became fast friends with Jake from their first day together, and he with her. Janet told me of how Jake would do his "wing dance" in the morning, strutting down the floor like a plane taxiing for a take off, unloosening his wings after spending the night in his cage. His other "trick" was to peck at people's feet when they were in the store. Since I always wear open sandals, I had to be real careful whenever he was around. It was a very bad day for Katha. Her dog Barky also died at home after a brief illness. She is making some serious decisions about her future, because she has to move out of the building at 1229 Duval St. It's being converted to transient housing and she has to be out of the store by June. She's looking at another location on Southard St., just off Duval as a new location. In fact, yesterday was the sixth anniversary of the very day that the Chicken Store opened in 1999. All in all, it was an eventful and memorable, albeit sad, day in The Real Key West.